Air Florida (IATA: QH, ICAO: FLA, and Callsign: Palm) was a small U.S. and international airline based out of Miami International Airport. It started operations in 1972, after being formed in 1971. Air Florida operated jet service between cities within Florida, but in 1978 it started flying beyond Florida and into other states. 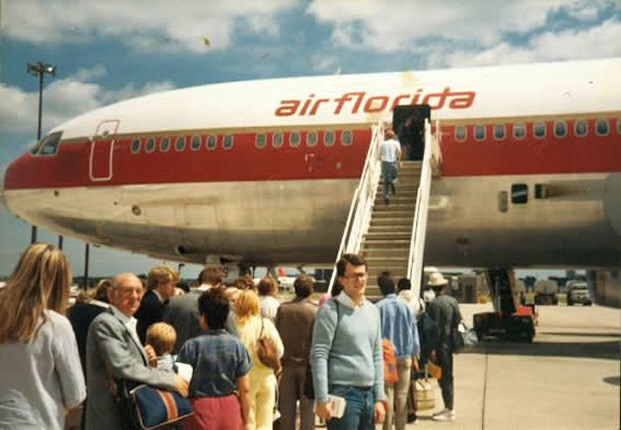 Air Florida was able to have a large presence on the Northeast-to-Florida market for quite some time during the 1970s and 1980s. On January 13, 1982, Air Florida Flight 90 crashed into Washington, DC's 14th Street Bridge and fell into the Potomac River shortly after taking off. A total of 70 passengers and 4 crew died, as well as four motorists; only four passengers and one crew member survived. It was discovered that the cause of the crash was that the pressure sensors in the plane's engines had been frozen by the snow, and thereby causing erronous engine indications. This led to the flight crew not applying the appropriate power setting, and the aircraft stalled after take-off. Despite the freezing weather and snowy conditions, the crew failed to activate the anti-ice systems. Radio personality Howard Stern became infamous when, while hosting his show on station DC101 one day after the crash, he pretended to phone Air Florida and ask what the fare was for a one-way ticket from National Airport to the 14th Street Bridge. Air Florida tried several times to buy out Western Airlines during the 1980s, to increase their presence in the West and begin flights to Mexico and western Canada. However, the negotiations with Western, which later was absorbed by Delta Air Lines, only got Air Florida 16 percent of the California-based company. After it filed for bankruptcy, Air Florida eventually folded on July 3, 1984. Its assets were acquired by Midway Airlines. The airline operated such types as the Boeing 707, McDonnell Douglas DC-9 and DC-10, Boeing 727s and Lockheed Electras along with the 737 jets. CLICK AN AIRLINE MEMORABILIA ITEM TO SEE THOUSANDS OF AVIATION ITEMS AT DISCOUNT PRICES!